Check out this article on Flow Measurement Interview Questions and Answers which are useful to crack your interview as a Instrument Engineer. 1. What is ‘volumetric’ and ‘rate of flow’? Write their measuring units in metric. The total amount of fluid passed through a process line. Generally it is measured on counters. The measuring unit is cubic meter, Barrels…etc. The amount of fluid moving through a process line per period of time. Generally it is measured on indicators, recorders. The measuring uit is cubic meter per day, barrels per day…etc. 2. 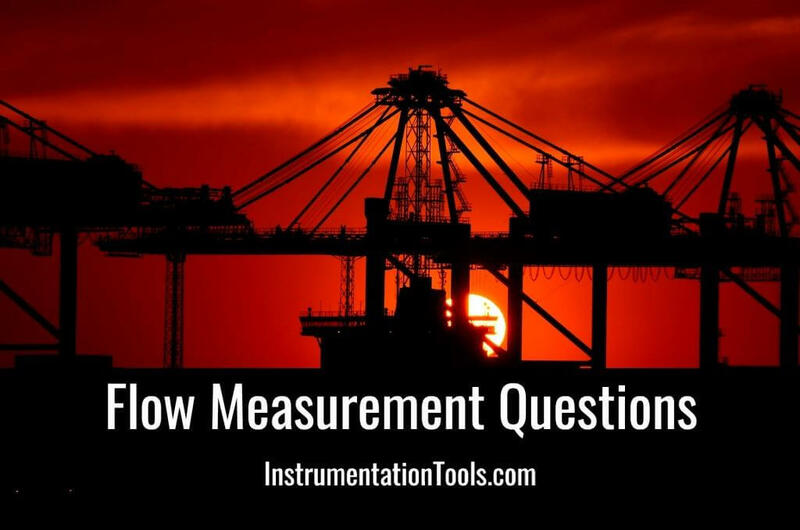 What are the types of flow; measuring instruments used in industries? Orifice plate and a DP transmitter, Daniel orifice and DP transmitter, Rotameter, Dall Tube, Venturi Tube, PD meters…etc. 3. What are the types of flow measurements commonly used in DPU-A? Orifice plate and a DP transmitter, Daniel Orifice and a DP Transmitter, Rotameter, PD meters. 4. What is ‘Burnollious Theorem’? What does it explain? It explains that when there is a restriction line a fluid flow line a ‘DP’ (differential pressure) is created. The DP is maximum at the veena contract point. The flow measured in the flow line is proportional to the square root of the DP measured where ‘K’ is a constant. 5. What is the function of an orifice plate in flow measurement? An orifice plate creates a differential pressure in a flow line. The DP created is use for measuring the flow through the process line. 6. How much maximum and minimum orifice ‘d’ (orifice diameter) id permitted in a pipeline? ‘d’ – the Orifice diameter should be in-between 0.25 and 0.75 of the pipeline ‘D’ diameter. 7. What is the difference between an orifice plate used in oil and gas flow measurement? The orifice plate used in a gas line will be having a small drain whole at the bottom of the orifice plate. 8. Draw a simple sketch of an orifice plate showing it’s upstream, downstream and the shamper edge. 9. How to identify a newly installed orifice plate upstream in a pipeline? The upstream can be identified by the orifice plate’s Tag number markings. Tag numbers are always marked on the upstream of the orifice plate. 10. How much upstream and downstream straight length run is essential for an orifice plate flow measurement? An upstream of 28D and a down steam of minimum 7D is essential for an accurate orifice plate flow measuring system (where D= pipe line diameter). Greater the upstream and downstream length, lesser the flow turbulence and grater the accuracy in the flow measurement. 11. What type of orifice tapping is commonly used ? In general, is using the ‘Flange Tapping’. The upstream and downstream orifice tapping are taken from the flanges. 12. Why and when is flow measured on a square root scale? Flow is measured on a square root scale only when the measurement is done through an orifice plate and a DP transmitter. The flow measured through the orifice plate is always proportional to the square root of the DP across the orifice plate. 13. What is a ‘flow factor’? A ‘flow factor’ is to multiply the flow transmitter signal measured on a 0-10 square root or 0-100 linear scale to get the flow calculated by flow metering. This is used due to the standardization of the transmitters signals, to 20-100 kPa or 4-20mA. 14. What are the important parameters considered in deriving a flow factor? 15. Explain the installation of a DP flow transmitter on a gas and liquid pipeline? Gas line: the transmitter is installed above the orifice plate to prevent the condensation of gas in the signal line and in the HP & LP chambers. Liquid line: the transmitter is installed below the orifice plate to prevent the gas trapping in the signal line and in the HP & LP chambers. 16. What is a ‘zero check’ and ‘static zero check’ on a DP flow transmitter? A procedure for checking the transmitter output is equal to 4.00 mA when its HP & LP chambers are equalized and are at the atmospheric pressure. A procedure for checking the transmitter output is equal to 4.00 mA when its HP & LP chambers are equalized and are at the operating pressure. 17. Why is flow measurement not very accurate? Flow measurement is less accurate compared to level, temperature and pressure measurement. This is due to the consideration of various parameters while measuring a flow. These parameters, such as the accuracy of the orifice plate diameter, the pipeline diameter their operating parameters such as temperature and pressure do not remain same in the process operation as the designed parameters. Generally, an accuracy of 5% is permitted in a flow measurement. 18. What is the actual flow, if the operating pressure is higher then the designed pressure? If the operating pressure is higher than the designed pressure the true flow will be higher then the measured pressure. A simple calculation is as follows. 19. What will be the new flow factor if a DP transmitter is re-ranged from 25 kPa to 50 kPa? The new flow factor will be 1.41 times higher than the existing flow factor. 20. Why generally is a flow transmitter installed upstream of a flow control valve? A flow transmitter is always installed on the upstream of the flow control valve in order to maintain the operating pressure across the flow transmitter sensors. Downstream of the control valve the pressure changes as the control valve opens or closes. 21. Why is a pressure transmitter installed upstream of a flow transmitter? Upstream of a flow control valve a pressure transmitter is installed to measure the operating pressure. At times it is used for computing the true flow against the designed pressure. Downstream of the control valve the pressure changes as the control valve opens and closes. 22. What is the operating principle of a turbine meter? A magnetic pickup installed above a turbine meter measures the number of magnetic flux cut by the turbine meter blades and produces pulses proportional to the volume of liquid flow through the meter. 23. What is the output of a turbine meter? The output of the turbine meter is in pulses. The pulse per the volume of liquid is constant and distinct for each meter. When a known quantity of liquid flows through the meter, a known number of pulses are produced. 24. What does a pre-amplifier do on a turbine meter? The magnetic pickup inside the turbine meter produces pulses around 30 mv peak to peak. A pre-amplifier magnifies the small signal to a 12 V DC peak to peak square waves and transmits a signal to the control room. 25. What are the advantages and disadvantages of a turbine meter Vs an orifice plate flow measurement? Turbine meter is a good flow measuring unit when the fluid is low clean fluid. The turbine meter measures the volumetric flow. It is directly installed on the flow line. Its accuracy in flow measurement is high. Accuracy can be re-calculated and the ‘k’ factor can be reset periodically. 26. What is a ‘k’ factor on a turbine meter? Who provides the ‘k’ factor? Each turbine meter is specified with a ’k’ factor which represents the number of pulses produced per a known quantity of liquid. Generally the ‘k’ factor is provided by the manufacturer. 27. One cubic meter is equal to how many gallons? 1 Cubic Meter = 264.2 gallons. 28. Why are counters ( totaliser ) used in flow measurement? Counters are used for measuring the ‘volumetric flow’ of the fluid in a pipeline. Hi! Very use full information thanks…. Hello Prasad, Click Print button below the Post title & save it in PDF. Its all available to everyone. I want some information about fuel gas metering calculation formula and factors. Soon it will be posted. Good web for improving skills I loved it. Nice guide thanks for sharing. I have a question and an observation. There are a couple of typos on example is Bernoulli’s theorem (easy fix). The other is I’ve seen the question about flow upstream or downstream of a control valve question and it always has the same answer you gave. It seems to me that the pressure drop can’t be maintained on either side. If the valve is closed the flow is zero and upstream the differential pressure will go to zero. Two things that do seem different is that the upstream side will always have a higher pressure and in single phase flow the upstream side should stay single phase. very nice…keep it up….very useful for Instrumentation Engineer…..